Apologies for missing last week’s news – I blame travel and March Madness (of the non-profit variety, not basketball!). On the plus side, the weather is definitely improving outside – perhaps not difficult after one of the coldest February’s on record – and the calendar is beginning to fill up with local spring events. Leadership Saskatoon is hosting a Lunch and Learn panel discussion on Wednesday March 20 on the topic of Human Rights, Volunteers & Your Workplace. The fifth-annual YXE Connects, an annual one-stop shop for community services and supports in Saskatoon, will be taking place on Monday May 6. Registration is now open for service providers, volunteer hairdressers and barbers, and general volunteers. Technically not in Saskatoon, but Tamarack Community Institute is hosting a workshop in Edmonton on Asset-Based Community Development May 28-30. I’ve heard that there are some folks here in Saskatoon who are looking to register and travel together to save on costs and thus help build capacity in this area locally – if you’re interested in attending this workshop, drop me a line and I can put you in touch with those people. Kim van der Woerd (Eval Cafe alum!) and Billie Joe Rogers are returning to Saskatoon on June 18 to lead a one-day workshop on Culturally Responsive Evaluation with Indigenous Populations. The Saskatoon Poverty Reduction Partnership’s 12 Bold Ideas to Eliminate Poverty document is now available for download. Leadership Saskatoon is accepting applications for their flagship 10-month leadership development program. Not much new this week, aside from the opening of a grant opportunity through the Saskatoon Community Foundation. Sometimes it’s just a slow news week, I guess! The next news post here will be the week of March 4. 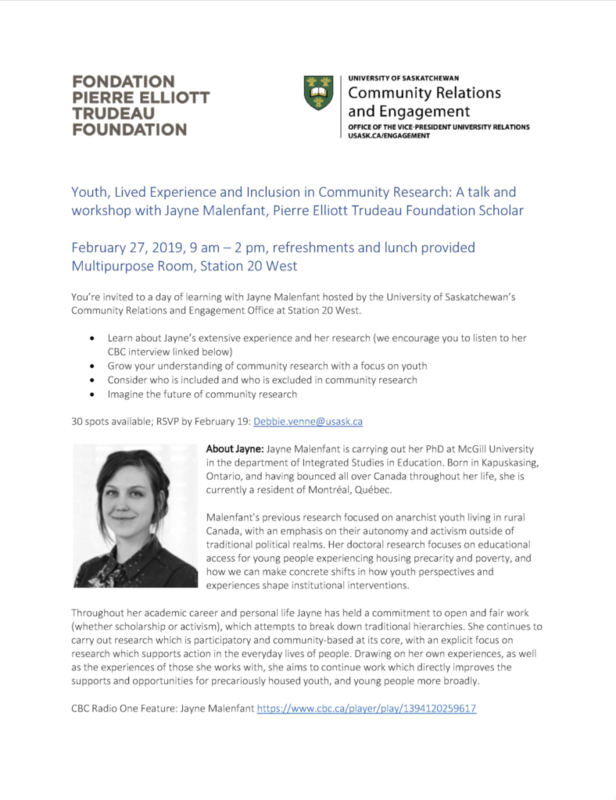 The University of Saskatchewan’s Community Relations and Engagement Office is hosting a talk and workshop on February 27 with Jayne Malenfant on the topic of “Youth, Lived Experience and Inclusion in Community Research”. More details in the poster. Kylie Hutchison will be leading a webinar on February 26 on hosting data parties. Mark Cabaj and Galen MacLusky are hosting a Tamarack webinar on the Systems Change Evaluation Canvas on March 12. Saskatoon Community Foundation has opened their call for proposals for the Youth Endowment Saskatoon (YES) fund, with a focus on supporting healthy living for children and youth. Some great events happening this week in Saskatoon – though if you want to stay indoors with the weather (or if you’re reading this in a place where “snow” and “cold” are four letter words), we’ve got you covered too with a couple of online evaluation-related events coming up. The University of Saskatchewan is celebrating Indigenous Achievement Week this week, with multiple events on campus including an awards ceremony on Thursday afternoon (February 7th). 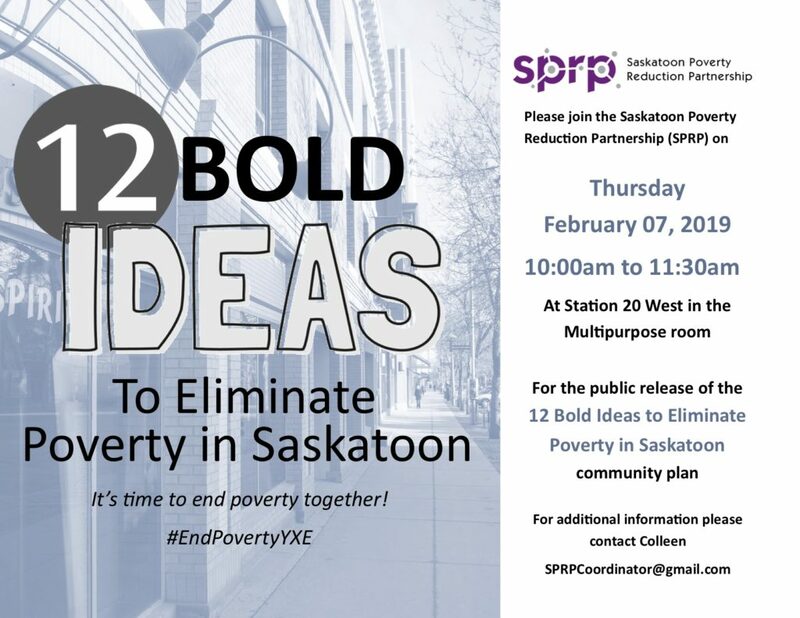 Also on February 7th, the Saskatoon Poverty Reduction Partnership is publicly releasing “12 Bold Ideas to Eliminate Poverty in Saskatoon” at Station 20 West, starting at 10am. Full disclosure: I have participated in some of the discussions and planning work around this document. Interested in knowledge mobilization? KM in the AM is hosting a morning workshop February 11th on brave, honest conversations. Reconciliation Saskatoon’s Learning Committee is presenting a KAIROS blanket exercise – an interactive experience looking at Canadian history from an Indigenous viewpoint – on February 15th at Station 20 West. Kylie Hutchison (another Eval Cafe alum!) will be leading a webinar on February 26 on hosting data parties. February is Black History Month, and the Centre for Social Innovation has a great annotated reading list for anyone interested in learning more about both the historic context and present day realities. As hinted at earlier this month, one area I would like to (re-)start on this website is regular news updates. While Saskatoon can often feel like a small town, especially in the non-profit sector, it has grown to the point where we have many interesting events happening – and more importantly, we can’t just rely on word of mouth or “being in the know” to be aware of all of them! And of course, there’s a whole sea of online events that can be useful where you are (and which conveniently don’t require you to leave your home or office when it’s -35 out!). So, I’m trying the regular news format again to help provide a coherent signal amidst the noise for Saskatoon-based nonprofits. It’ll be a weekly update on Tuesdays (to start) and include both Saskatoon-specific items and online events, with a focus on Strong Roots Consulting’s strengths – namely, community-based research, strategic planning, and program evaluation. This week we have a couple of last minute events in town combined with a good range of evaluation-related online learning opportunities – so if you have professional development funds to be used up before fiscal year end, make sure to check them out! And finally, some good news from CRA (how often can you say that?) for organizations with charitable status who also engage in advocacy or public education work. Tomorrow (January 30) Erin Ryan-Walsh of William Joseph is hosting a free workshop on Marketing for Nonprofits. Seating is limited and registration is required – they have an earlier session that has already filled up, so if you’re interested don’t delay in signing up! The Saskatchewan chapter of the Canadian Evaluation Society (CES-SK) is holding a meet and great tomorrow evening (January 30) at the Thirsty Scholar. Open to anyone who is interested in evaluation! Finally, next Thursday, February 7, the Saskatoon Poverty Reduction Partnership is publicly releasing 12 Bold Ideas to Eliminate Poverty in Saskatoon at Station 20 West. Full disclosure: I have participated in some of the discussions and planning work around this document, and I’m glad to see it go forward! See poster for more details. CES-SK will be offering the Essential Skills Series for learning the basics about program evaluation through an online format starting February 4. Another online evaluation-related course, the Art of Evaluating in Complexity, begins February 5 and runs for the four Tuesdays in that month. Full disclosure: Chris Corrigan was a recent guest on Eval Cafe, and Carolyn Camman (co-host on the podcast) is one of the guest presenters for the course. Later in February, SFU is hosting a free webinar on their Evaluation Certificate program (which includes past Eval Cafe guest Kim van der Woerd as an instructor!). I often joke that I’m not a lawyer and I don’t even play one on TV, but here’s some welcome news from folks who are in fact lawyers: CRA Releases Draft Guidance on New Rules Permitting Charities to Engage in ‘Public Policy Dialogue and Development Activities’ (hat tip to the Centre for Social Innovation’s newsletter). From a brief non-lawyerly read, it seems that CRA is more explicitly allowing activities that were formerly in a grey zone, such as research, representations on public policy, and public mobilization around issues that are related to the charity’s stated charitable purpose. Still prohibited are activities that “directly or indirectly support or oppose a political party or candidate”, including transferring resources to a third party for that purpose. If your charity does any type of work in this area or is considering doing so, it would be worthwhile to read through the above link and consider consulting with legal professionals to ensure your policies and practices are on-side. Greetings from Calgary! I’m in town for this year’s edition of the Canadian Evaluation Society (CES) conference. While I’m excited as always to be participating, during my trip preparations I realized that my last post online was from last year’s conference! Though the site may have been quiet these past twelve months, Strong Roots Consulting has been anything but, filled with both interesting client projects and some initiatives to develop our own capacity. On that second topic, here’s a quick run-down on where we’ve been and where we plan to go. If this past year had a theme, it would have been “Learn and Share”. In addition to last year’s CES conference in Vancouver, I presented at the biennial conference of the Society for Community Research and Action (SCRA) and attended learning events hosted by Tamarack Institute on Cities of the Future, Evaluating Community Impact, and Asset-Based Community Development. While all of those events were great, the most personally-meaningful workshop I attended was right at home on the topic of Decolonizing Evaluation. Led by Kim van der Woerd and Billie Joe Rogers from Reciprocal Consulting and featuring a case study of Reconciliation Saskatoon, the two days featured thought-provoking content and great discussions on how evaluations can be designed to be culturally-responsive rather than perpetuating inequitable and harmful relationships. For some time I’ve had the idea of hosting introductory evaluation workshops in Saskatoon. Thanks tofellow consultant Micheal Heimlick of Two Bridges Consulting, the Saskatchewan chapter of CES, and the Saskatoon Poverty Reduction Partnership, this dream was realized when we hosted a free half-day “Eval 101” session at Station 20 West in Saskatoon. Based on the positive feedback and requests received since then for a repeat event, I hope to continue offering these workshops in the future! Although the blog was quiet, I have definitely been active online! As usual, my Twitter account lit up during the learning events I attended – expect the same during the next few days at CES. The website also saw a bit of a refresh, taking down some old pages and streamlining and updating existing content. What I’m most excited about in this area is Eval Cafe, a podcast that I co-host with Carolyn Camman. At its heart, the podcast is two evaluators having a casual chat on different topics. So far we’ve covered “serious” topics like participatory approaches and evaluation ethics, along with more whimsical affairs such as boldly going where evaluation and Star Trek intersect (thanks to Kylie Hutchison for joining us for that one!). Carolyn and I will be recording an episode at CES this year, and we both look forward to sharing our discussions in the months to come. Now that I have the mic and some experience recording, I’ve been thinking about a solo podcast project to go alongside Eval Cafe – stay tuned on that! One of the biggest developments for the business this year has been hiring an associate. I’ve always enjoyed working with others who have a similar passion for supporting community initiatives and organizations, but up until now it’s always been on a partnership or subcontracting basis for specific projects. Earlier this month, Strong Roots Consulting welcomed Lindsay Herman as a term associate for the summer. Lindsay recently finished her Masters degree in Urban Planning at the University of Saskatchewan and brings a strong focus on community to her work. In addition to working on client projects, our hope is that we can both contribute to the Saskatoon Poverty Reduction Partnership’s efforts in creating and evaluating a municipal poverty strategy. A few months ago, I started the application process for the Credentialed Evaluator (CE) designation through CES. The program serves to recognize education and skills related to specific evaluator competencies and promote ongoing professional development. While I didn’t quite meet my aim of submitting the full application before the conference, my hope is to get it in within the next few weeks. Finally, the business is coming up to its sixth anniversary and we’re using the anniversary to take stock of where we’ve been and how we can continue supporting non-profit organizations and community change initiatives. Oh, and last but not least, I’ll be testing a new approach to the blog to ensure more regular content and fewer months- (or year-) long gaps between posts. More news to come as these pieces come together: keep your eye on the blog here for the latest! That’s it for now. If you’re at CES this year, come find me and say hi! News: Funds, Retreats, Conversations, and Growth! What could be better than spending a month in Banff? Spending a month in Banff with other change makers and leaders on an intense retreat to explore social innovation concepts and work on developing your own ideas! Did I mention that it’s free? More details including an application form (due March 1) are available on The Banff Centre’s website. The deadline is quickly approaching for the Saskatoon Community Foundation’s Quality of Life Grants! Amounts in the range of $5,000-10,000 are available for registered charities in any of the Foundation’s seven areas of focus, with an emphasis this year on early childhood development. A brief Letter of Intent form is due through their online system by February 1: applicants selected from this stage will be invited to complete a full application for March 1. Also from the Saskatoon Community Foundation is a brief survey for local charities related to debt financing. From the survey preamble and questions, it sounds like they’re investigating opportunities to support charities through low-interest loans and other forms of social financing. Taken together with Affinity’s successful social enterprise crowdfunding campaign late last year, there’s definitely some momentum in Saskatoon for supporting for-impact organizations in new ways! My co-conspirator Sheena Greer is hosting another Playdate later this week for a select group of local nonprofiteers. I was part of the inaugural group back in August – it was awesome then, so I can’t wait to hear what she comes up with this time! There will be a Salon Colludo networking event following the Playdate, open to anyone “working for or interested in the nonprofit & social sectors in Saskatoon”. It’s a come and go event running from 4-8pm on Thursday January 22 at Mediterranno on 3rd Avenue. Hope to see you there! The Saskatoon Food Bank and Learning Centre (SFBLC) is hosting a Community Conversation for community members and local organizations alike. Taking place on Wednesday February 4 between 10am-1pm and again from 5-8 (short presentations at 10:30 and 5:30) at Station 20 West, this event is an opportunity to learn more about the work that SFBLC does in the community, how it views the issue of food security and poverty, share your feedback on its current approaches and ideas for the future, and connect with staff, volunteers, and other people interested in this issue. RSVP’s are appreciated (contact info on the Facebook page) and everyone is welcome. Couldn’t share an update on happenings without talking about Strong Roots, right? There are some exciting changes afoot, starting with a transition at the end of this month from the home office/coworking space split into a commercial office space that I’m sharing with a friend. It’s still at the Two Twenty so I get to keep all the privileges, perks, and social connections I’ve developed there, but now with a bit more, well, rootedness. Got something interesting happening in Saskatoon and area to share? Drop me a line! For those of us who strive to make our world a better place – whether you work for a charity, a non-profit service provider, an advocacy organization, a social-purpose business, or are “just” a community member who is passionate for a cause – there is really no time that is absolutely quiet: no time where there isn’t someone in need, an action we can take, or a new idea that we can sketch out. Although we encourage others to take time for themselves and those they care about, we’re not always so good at following our own advice. First, if you are at work over the next week, whether it’s providing support to those in crisis, heading across the country to help restore power in areas affected by ice storms, or staffing a desk at a community service, thank you. Our world doesn’t shut down just because of the holidays: your efforts are important and even crucial for those who face difficulties during this “quiet” time of year. I also hope that you get at least some time over the next week with friends and family to rest and recharge. Second, for those who do have the opportunity for a break, take it! Spend it with those who are important in your life and reflect on the positives in your life and work. If you’re so inclined, think about what you want to see happen in the months to come, but don’t let it dominate your time away. Come back in the new year refreshed and ready for the challenges and opportunities that 2014 will bring. Finally, for everyone, enter 2014 with the idea that we all can make a difference. Every day brings us choices, from what we do at work and how we interact with those we meet, to what we value and what we want to see in our neighbourhoods and our world. The impact may not be readily apparent, but it is the small actions of many that make a difference. I hope you find what you need this holiday season, safe travels to those who are visiting friends and family, and I look forward to connecting and collaborating in the new year! Strong Roots will be on break for the remainder of the year, returning to normal operations on Friday, January 3. I will still respond to email and phone inquiries during that time as I am able, however it may take longer than my customary two business day response window. Tis the season for looking back at the year that has passed and making plans for the new one on our doorstep, and Strong Roots Consulting is not immune to this time-honoured tradition. 2013 has been a good year to both me and the business overall (injuries aside! ), but I have definitely identified some room for improvement, including how I track my time, where I draw the line between Brian Hoessler the individual and Strong Roots Consulting the venture, and what is the best way to incorporate social media in my work. During a brainstorming session, I started thinking of where I would like Strong Roots to be by this time in 2014. The problem I ran into is that these outcomes were all fairly generic: review and revise some of the business elements, define a clear mission, vision, and goals, and sketch out a path to reaching those goals, including initial actions, milestones, and rubrics/indicators, resources needed (including my own professional development), and processes for reviewing progress and adapting in response. I could easily see myself dragging my feet on these pieces and be no further along come next December: worse, if I only accomplished these outcomes, the year would not have been very productive! The solution I hit on? Change the deadline. I am giving myself three months, to March 16, 2014, to have these pieces together, so I can spend the remaining nine months of 2014 following through. Another component to keep me on track is my commitment to report back through this website on the progress I’ve made, at the very least at the one- and two-month yardsticks (i.e. January 16th and February 16th) and when completed: I hope that sharing this experience will also be useful for my readers who are wrestling with their own planning, be it for individual growth or organizational change. I already have some ideas on all of the outcomes identified above, and just writing them out and sharing my thoughts this way is helping to fuel my enthusiasm and determination to move ahead. What are your goals for the days to come, either personally or for your organization? Share below, or just follow along for the ride! As noted yesterday, fall heralds the arrival of another granting cycle with many applications due in October and November. Over the next week or two I’ll be updating the Saskatoon Grants section here on the site so that it continues to be an accurate one-stop resource for local organizations looking for funding. If you’re aware of any grants that I’ve missed or spot any errors, please let me know – drop a note in the comments or through email or Twitter. I can’t promise any tangible rewards but I will recognize tipsters with a thank you in a future post. That, and you’ll get that warm fuzzy feeling from helping out!